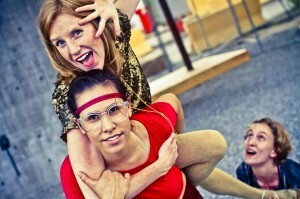 Plutos’ Revenge (Ten Toes Theatre), playing as part of the Toronto Fringe Festival 2012, is the story of a tiny little planet that just wants to fit in. Staged at the George Ignatieff Theatre, it is more dance than narrative but through movement manages to convey much. Pluto (Emma Letki) is the runt of the litter, the one who may or may not be a planet anymore, who is always a step behind in dance choreography, and a little more uncoordinated than her co-planets. She desperately wants to be part of the group and have friends, though she’s not quite sure how to go about it (her attempts are rather hilarious). She wants to be noticed. What happens when the solar system’s tiniest planet wants so badly to be a part of the group that she’ll do absolutely anything to get it? The set was simple and a live band – featuring guitars, a clarinet and a cello – accompanied the players. The music reflected the mood of the scene, and was all original compositions. The costumes were one of the highlights of the show, and really helped bring it to life. Each inter-galactic object had its own distinct personality from the popular, if a little ditzy, Sun (Kelly Morden), to the Hipster Mars (Aria Evans) to the tough yet surprisingly image-conscious Saturn (Natasha Joselyn). Pluto, of course, is High School awkwardness embodied. The dancing was another highlight. Realistically, dance is more appropriate for a show about planets than plot points. Gravitational forces bind them and determine their movements and while much of the story is told through movement, there is an impressive amount of character and story development. All in all, Pluto’s Revenge was a very creative piece – an interesting approach and a very imaginative production. For more on behind the scenes, check out Lucy Rupert’s interview with the writer, Meg Dryden, and director Emma Letki.